Westerners love to jump in their cars and drive out into the mountains or the countryside for a break from their stressful lives. Some people enjoy hiking or fly fishing. Others swim at the beach. And then there are those who simply enjoy driving along country roads. All of these people instinctively understand that nature has a wonderful restorative effect. Interacting with nature enhances the quality of their lives. The Japanese are well aware of this, too, but instead of hiking out into nature, their idea is to bring that nature back into their living environments. In small spaces next to their homes they create intimate gardens that evoke natural patterns such as deep forests, mountain streams, or seaside beaches. They don't try to "copy" nature and they don't try to shrink it down. Instead, the goal is to examine the essential qualities of the natural landscape and then distill those qualities in a scale and manner that matches an ordinary residence. There are many advantages to this approach. One, of course, is proximity. You don't need to take a long trip to see some famous waterfalls. They're right there next to your living room. And instead of experiencing the healing power of nature on the occasional weekend trip in the country, it is available every single day for you to enjoy. MAKING A GEOLOGICAL STATEMENT The Earth's surface can offer spectacular scenery. Many of the best Japanese gardens strive to mirror it through the use of berms, boulders, and site contours. 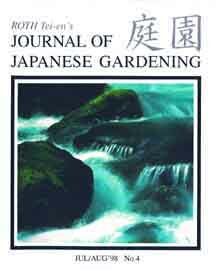 These JOJG articles are related to geology and how to make a geological statement in your own garden. WATERFALLS & CASCADES Nearly every Japanese garden features water. Water-related patterns can be seen in koi ponds and winding garden streams. But the Japanese garden also has a "dry garden" style called kare-san-sui which expresses "simulated" water patterns through the use of rock and gravel. WHERE THE WATER MEETS THE LAND Some of nature's most distinctive patterns occur along sea coasts and beside rivers where water action has eroded the soil, leaving exposed rock in its place. Japanese gardens capture these patterns by using large edge boulders beside garden streams and pond waterfalls. The edge rocks are placed in specific patterns that provide a convincing natural effect as well as providing for erosion control. MATERIALS THAT FIT THE SCENE If you want to create a convincing scene it helps to select materials that suit the mood of your site. For example, sharp craggy rocks work well in higher "mountain" areas while rounded, weather-worn rocks look appropriate in lower areas beside water. Similar criteria exist for plant selection. NATURAL MOTIFS Japan has long used motifs to suggest entire natural patterns. Those motifs can be seen on Japanese crests, in textiles, and on the wood/basketry employed in interior design. Motifs can also be employed in Japanese gardens and Japanese garden outbuildings. These JOJG articles examine the topic of motifs and natural patterns.